Ton sur ton! Or monochrome. But I love it in French better. But it means the same. It’s a combination of colors in the same tint. Actually, it is a bit the opposite of color blocking I suppose. I saw this look in blue weeks ago on Pinterest. I knew I had to make it mine. My version of it that is. Funny that I never saw Pinterest as a social channel to get inspired by. And certainly after my account became suspended, I was no longer a fan of it. But when everything was resolved, I got pretty addicted to Pinning! I get a lot of inspiration now by fashion boards. I also created a board called Fashion Bloggers Real Life where you can share your outfits. Kind of counterpart on all those fake IG accounts, with a wink! But I would love it if you could join this group. If you want to, leave a comment with your Pinterest account name and I’ll send you an invitation. 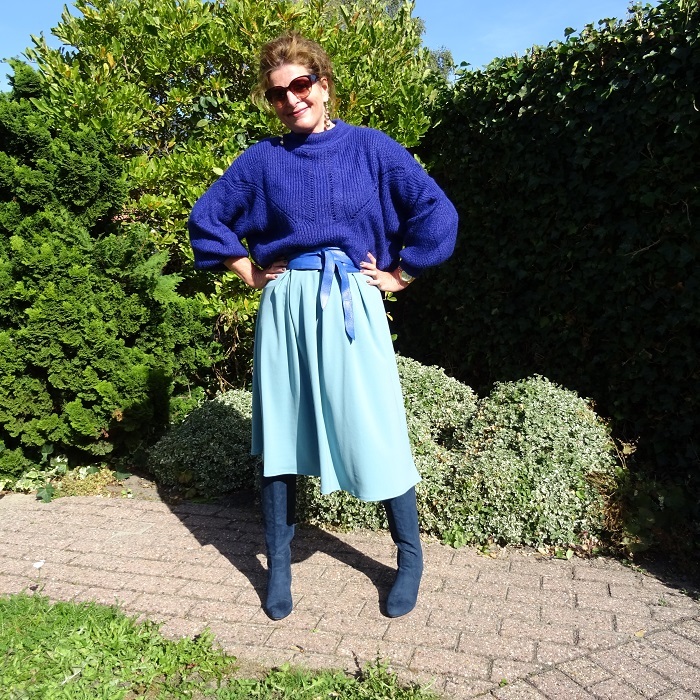 So I was inspired to wear a ton sur ton blue outfit. I had everything I needed for the outfit except the skirt! I did not have a blue skirt at all. Shame! 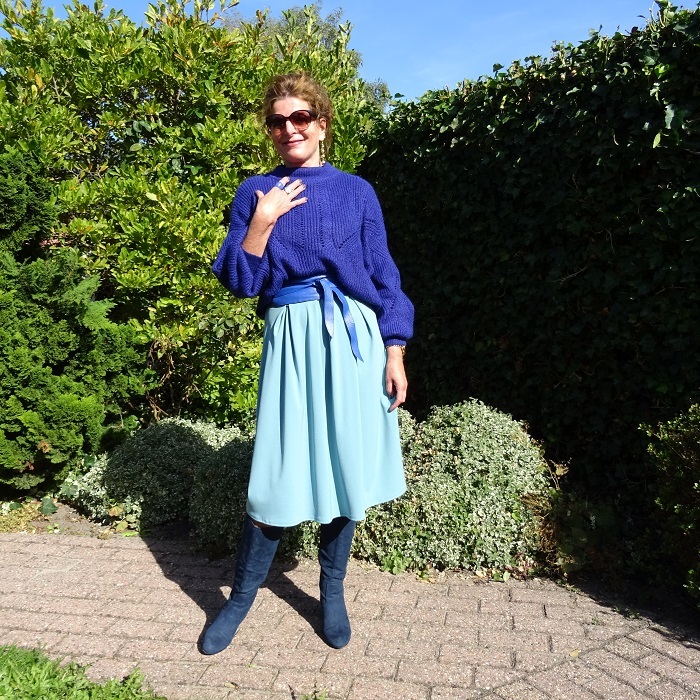 I ordered a black skirt a while ago (you know, for cycling hm) and it is such a nice skirt, (not for cycling) that I even ordered it in blue. I also think it is a nice shade of blue. Because the boots are dark blue, I think it is better to wear a lighter skirt. So I can wear a dark sweater because light blue on my face is not good. I better not wear cool colors in my face. The boots are old but aren’t they fantastic. Such a beautiful shade of blue. And they are suède, I like that better then leather for boots. Wearing blue rings, from Brighton. (from the parade, not the boulevard, wink to Penny and Anna) The belt I have actually had for a long time, but these are such nice belts. I think they call it in the US obi belt? Can someone tell me why? This post is for the Bloggers Battle! The theme was colors! If you think I’ve succeeded, then vote for me. I will put a link in one of my next posts! And bombard you with the voting link on all social media! No favorite yet as I am starting all over. I love the rich tones of that sweater. Looks great on you! Oh Penny I am so glad to be back again! But I am freaking tired now! Haha, have a great weekend lovely lady! Hahaha, I can understand that! Thanks love! Nancy you look fab in Blue, those boots are a lovely length I find it hard to get knee length ones to fit sometimes. Im insoired to search again…Have a super weekend! Yes me too. I want them not to wide, I think that looks so ugly with a more elegant boot. With some cool ones it doesn’t matter. Nancy, I love these shades of blue on you! Great ton sur ton look! I absolutely adore this monochromatic look! These blues are gorgeous together. Thanks for the link up! It does sound prettier in French doesn’t it? I love that chunky sweater, what a pretty color. I love a tone on tone look. Very chic. Would love to vote and support you! I am in awe that you almost had everything in your closet, well done. The skirt is fabulous ad it looks a little heavier, like wool, so I bet it’ll be perfect for the winter season too. Thank you very much Bojana! Oh thank you so much! Have a great weekend! I love this outfit, Nancy! Such pretty shades of blue! Thank you very much dear Andrea! Have a good weekend! Thank you! I send you a invitation! Yea, you’re back. I tried to pop over here a number of times the past week or so and your website was under construction or something. Cute look! LOVE the color. Such a fun outfit. Well I started all over again! The blog has moved. And I am glad to see you here again! Thanks Amy! So in love with these shades of blue together! Beautiful outfit! Thank you very much Edwige. I’m loving this blue on blue look! What a pretty skirt, and such great boots! I love the different shades of blue together Nancy! Those boots are fabulous! Thanks Emma! Great color right! Lovely shades of blue, you look fabulous! Hi, Nancy! Once again, I’m glad I’m able to get on your blog! I’m a big ton sur ton fan! As a matter of fact, I just did a photo shoot this morning with blues–ha! Does the belt stay snug enough for you? I’ve been eyeing a similar one, but was unsure if it would stay. Yes it does! It are perfect belts, I think. Love to see your blue outfit! 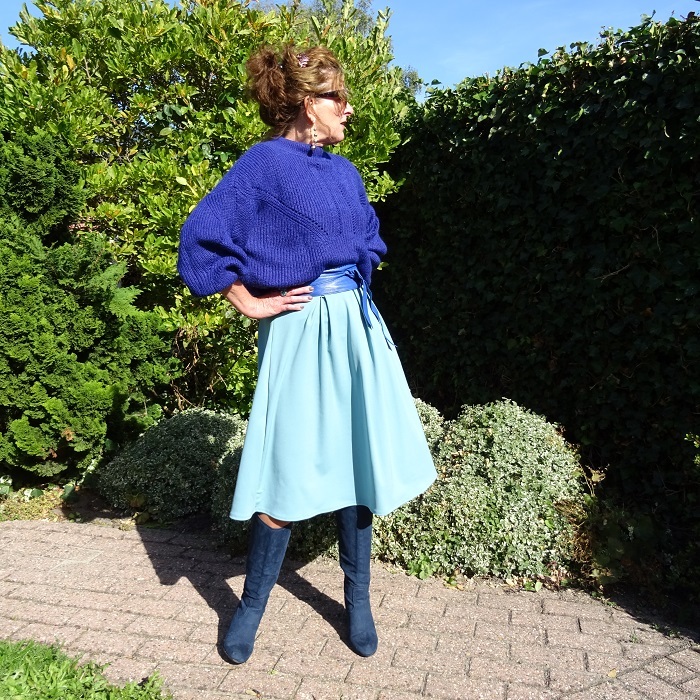 Your outfit looking in shades of blue, the skirt is such a0 flattering style!! Monochrome definitely sounds better in French. Thank you for introducing me to a new term! Ha, have a great time in Zeeland! These shades of blue are so pretty together and on you! Oh, I LOVE all of these shades of blue! Such a beautiful look! Always so stylish! Love the whole look! I love these pretty shades of blue together! Thanks for hosting and you look nice. Have a wonderful weekend. Thanks Claire, have a good weekend! Yes, the boots are so beautiful. A real warm blue color! Have a good weekend Lieske. I love this blue monochrome look and you did a fantastic job. You look fabulous and those suede boots are my favorite. The color is nothing like I have ever seen and really compliments your entire outfit. Happy weekend! Thank you so much Maureen! Happy weekend! 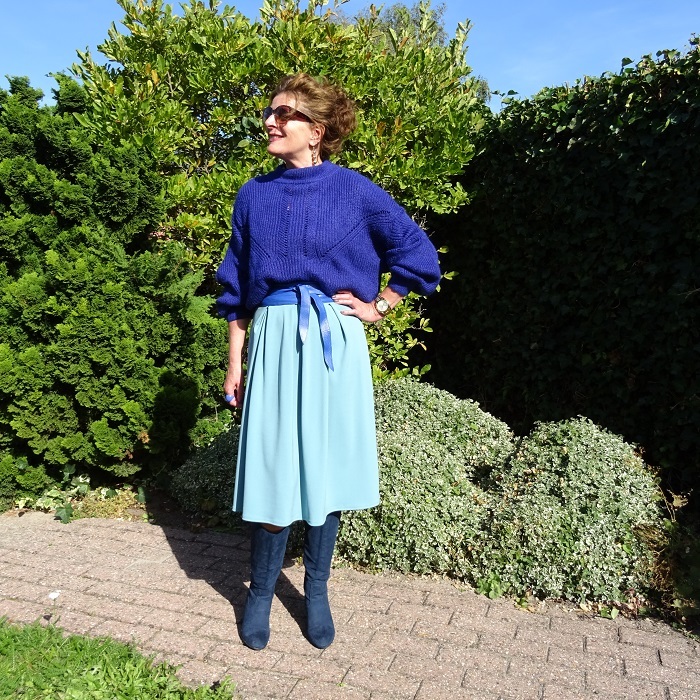 Shades of Blue – the skirt is my favorit – enjoy your Sunday! Nancy, I love your Ton sur ton! look! What great inspiration! I never thought I’d spend any time on Pinterest either, but once I started blogging I find it a great place for ideas! SO many lovely looks, so little time–and funds!! Haha! Thanks for sponsoring the Link Ups and sharing your personal style. Thank you very much Darlene! 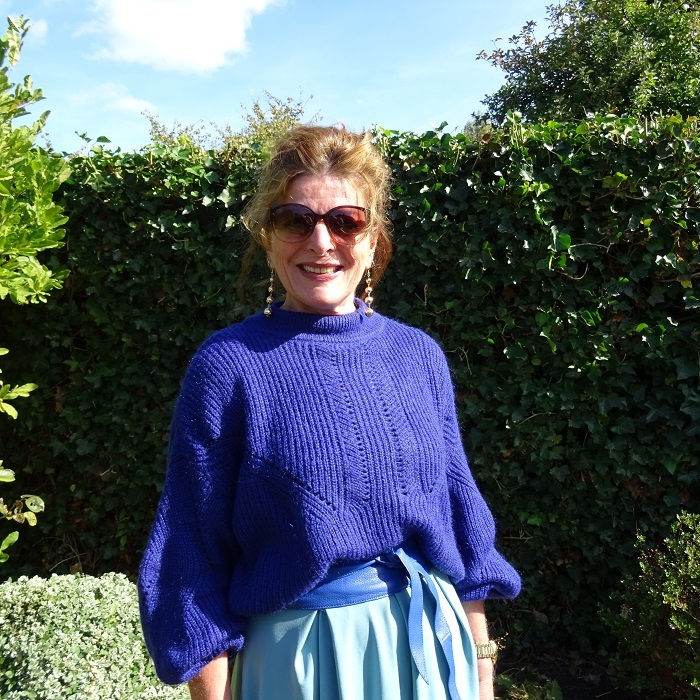 Wonderful colours, Nancy – I see we share similar tastes in leather obis! Yes we do! I have several now! Cute and super cozy look dear. Loving the sweater and skirt combo, really cool play of colors. Love this look. Classic with a twist. Am drooling over those blue suede boots. As soon as I read the phrase “ton sur ton” I remembered there was a clothing line from the 80s with that name. Are you familiar with it? They sold some really cute colorful stuff. But it wasn’t all monochromatic! Vagely, i have to look that up! Thanks! I love blue color. All shades of blue. Great outfit.